Over the years, I’ve enjoyed putting together books of some of my favorite images, and of client gardens. Here are those that can be ordered through Blurb. 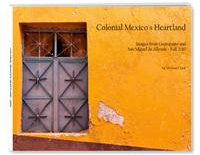 A book of images from my Mexico trip is available through My Publisher; if you are interested, please contact me for ordering information. I just got my copy of “The Garden is Open” today in the mail. I love it. Nice work putting the book together. It will be a great reference for the future. So glad you like it! I do hope you find it useful. Thanks for the kind words.